It’s understandable that Silicon Valley might look more attractive than the Rust Belt to early-career attorneys. Industry-disrupting dynamic growth, a risk capital culture, and talent mobility make the tech world seem like an exciting place to be. However, even a casual look at Cliffs Natural Resources, a leading iron ore mining company based in Cleveland, Ohio, suggests something else. The business of commodity minerals has a lot going on. Indeed, there’s a lot of steel in the gleaming, sprawling California office campuses of Palo Alto, Mountain View, and Cupertino, as well as the roads and bridges that get everyone to work—just as there are 70,000 bridges in America that need to be repaired or rebuilt. While a lot of that can come from steel recycling and foreign steelmakers, about 150,000 people work in iron and steel mills in the United States with another 69,000 in foundries. That creates $113 billion in products every year. 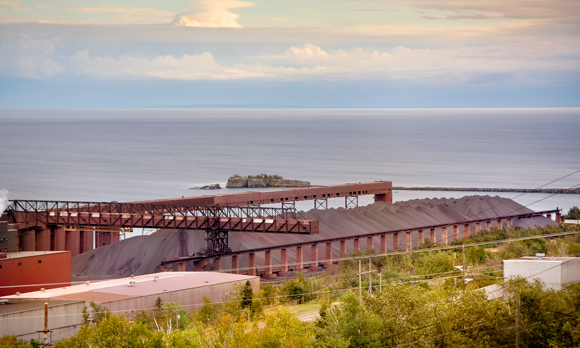 The bulk of iron ore mining in the United States is in the natural deposits in Minnesota and the Upper Peninsula of Michigan, and four of seven major mines there are operated by Cliffs to make iron ore pellets. The proximity of those mines to the shipping capabilities of the Great Lakes explains why Cleveland is home to this company, which has a current market cap of approximately $1.5 billion. In the decade Graham has been with the company—he joined in 2007 after ten years in private practice—he’s seen lots: breathtaking price volatility, a crippling recession, acquisitions and divestments, rounds of raising debt and equity capital, shareholder litigation, multiyear customer contract negotiations, plus another iron ore company’s 2015 industrial disaster. Occurring in Brazil, it affected worldwide pellet supplies and pricing (Cliffs’ primary product is a pellet form of iron). “In 2011, the price of ore was $190 per ton, but by the end of 2015 it was $38 a ton,” Graham says. He reviews the legal nature of communications around earnings reports, but those prices affect nearly everything that happens in the company. Without question, when automotive, construction, and durable goods manufacturing declined in the Great Recession following 2008, the steel customers’ markets for Cliffs iron ore suffered. Of equal impact and somewhat disconnected from the business cycles, however, is how foreign steel producers “dump” their products on the American market, selling subsidized steel at cheap prices while undercutting domestic producers. The problem was so severe in early 2016 that the US Department of Commerce imposed a tariff of 265.79 percent on Chinese cold-rolled steel products. Prior to imposing those tariffs, ArcelorMittal, the world’s largest steelmaker and a major customer of Cliffs, reported an $8 billion loss while US Steel Corporation lost an additional $1.5 billion, both of which resulted in widespread layoffs in 2015. These are the conditions under which Graham and his legal team—once thirty-six people, now down to ten—have worked in the past several years. After he started with the company as assistant general counsel, the company was able to buy $9 billion worth of assets. However, because of external conditions, the company had to reverse course and divest itself of many of those properties. Not everyone agreed on these acquisition and divestment issues. Shareholders were dissatisfied with the timing of the buying and selloffs. As a result, a significant amount of Graham’s time in the past several years has been negotiating with shareholders’ plaintiff attorneys. Lawsuits related to those actions have largely been resolved, but not without a significant impact on the company. In 2014, there was a proxy fight, which resulted in a complete turnover in the board of directors and installation of a new CEO who had led the activist shareholders. Graham, of course, had a front-row seat to all of this. He endured intact, even if the legal department took deep budgetary and staff cuts. That significant reduction in the legal department wasn’t an indicator of a lack of faith in Graham, and he’s working well under new leadership. That speaks to the shifting sands that characterize the industry. More than 60 percent of the steel produced in the United States is by electric arc furnaces or “minimills,” which don’t use the type of feedstock Cliffs produces. So the company is investing heavily in R&D that could substantially expand the business beyond where it is now to serve a new set of potential customers. It’s one of the reasons this self-described “Cleveland boy” is still excited to be working in one of the city’s oldest companies. Silicon Valley can have its digital properties—this is a company that takes rocks out of the ground that ultimately build the physical world where we live, work, and travel.